The next meeting of the American Research Seminar will take place on Thursday 3 November at 5pm in room SR24. 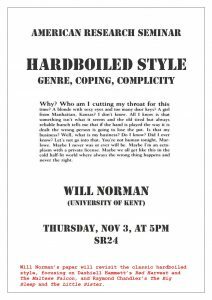 Dr Will Norman (University of Kent) will be giving a paper entitled ‘Hardboiled Style: Genre, Coping, Complicity’. He will be focusing on Dashiell Hammett’s Red Harvest and The Maltese Falcon, and Raymond Chandler’s The Big Sleep and The Little Sister.